Mossy Sedum (Sedum lydium) has brilliant green, fleshy succulent leaves that turn completely red in a drought and during the fall and winter. Mossy Sedum’s puffy white blooms with a hint of pink are a nice compliment. 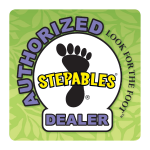 Sedum is great for rock garden paths, or spilling over banks and rock walls, but also quite useful in shady areas as well. 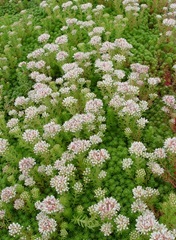 Sedum is also deer resistant and very drought tolerant.